Glyph names- what is in a name? I came across a rather intriguing problem while debugging a font issue in a PDF created by a tool called A-PDF. So value 2 maps onto glyph ‘A’, value 3 maps onto ‘B’ and value 4 maps onto the euro character. There is a list of all the standard glyph values, and the standard mappings used if you do not create your own. 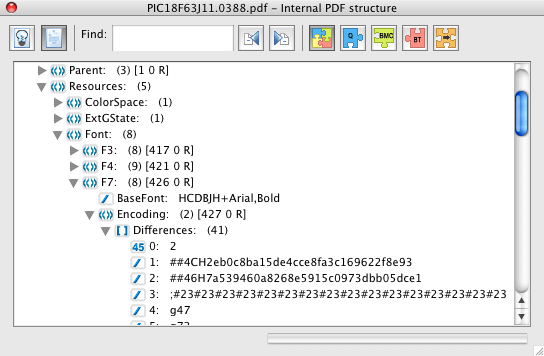 Appendix D of the PDF Reference lists the standard encodings and all the glyph names. Most of the time, you do not need to define your own values and can just use the already prepared tables – StandardEncoding, MacRomanEncoding, WinAnsiEncoding and so forth. Most of the time, this works fine, but what about this value, taken from the problem file. Usually, the # character indictates the next 2 characters are a numeric value we use – in theory, so long as we are consistent, it should not matter. But this is what it looks like in Acrobat. But for value 3, we strip the first 2. Why do we need to strip some of the values? I think that #23 is supposed to represent the Ascii character 0x23, which is “#”. It’s just confusing because the escape character is also #. If you preprocess the “#23#23CH2eb0” replacing every #nn with its ASCII equivalent, you’d get “##CH2eb0”. But somebody stuck the un-preprocessed string in the Differences dictionary.